Q. I spilled silver polish in my stainless steel sink and did not realize it until sometime later. Is there a way to get the stains out? The silver cleaner spilled in the sink was Tarn-X. The product worked! Thank you so much. Q. A cleaner, brand name Tarn-x, was wiped on the stove and left on. Later, the stove was wiped down after seeing various dark streaks and circles on what appear to have been former food spills and Tarn-x residue. The stove was washed down with soap and water; next I used Wright's Silver Cream [linked by editor to product info at Amazon] and it took the stove back to where it's original color was except for the heaviest of the streaks and dark colorations. What can I do to bring the entire stove back to it's original Stainless Steel color? Q. I have dark grey stains on my stainless sink from Tarn X I have scrubbed with everything. Any help out there would be great. A. I too got Tarn-x on my new kitchen sinks. After coming to this site, I remembered that to sell my other house, I used car polish to clean and polish the old sinks. I signed off and tried it. It took three applications, but there are no remaining black marks. I had used Meguiers at the old house. Today, I used some polish my friend put in a bottle for me last year, so, sorry about not knowing the name. Put some on a rag and rub hard. Let it dry and rub hard again. Repeat until gone. Your rag turns black and your sinks return to their original color. My sink seemed to have deeper brush groves around the top and that area took the most rubbing -- but all the stains came off. 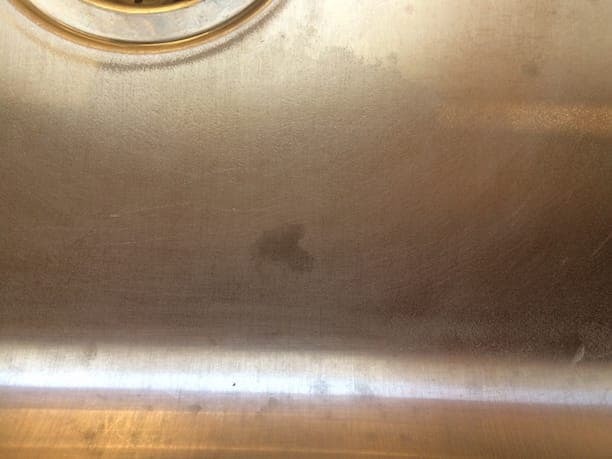 Q. I was cleaning my silver cutlery and some of the silver cleaning liquid got onto the stainless steel sink and has left marks as though the steel has been bleached. Any ideas of how to remove the marks please? A. Hi, Rita. As you see, we added your posting to a thread that already addresses this subject and offers three potential solutions. Hopefully other readers will avoid problems by recognizing that silver polish can stain stainless steel. Good luck. Q. I left a rag full of Tarn-x in my brand new, of one week, stainless steel sink over night. It now has a black mark on it; how do I remove this stain? I'm sick about it; the sink is one week old. Thanks for your help. A. After reading all the advice about cleaning my Tarn-x stain in my stainless steel, I got home and wiped the sink with Barkeeper's friend and to my surprise I was able to get rid of the stain 98%. You can hardly see the mess that I had. So, thanks to everyone who told me about the Barkeeper's friend; it's just too bad this product is not easily available in Montreal. I was lucky that I had bought some in Florida last time I was there; this product is great and I'll be cleaning my stainless sink with it from now on. For anyone in Montreal: I have seen Barkeeper's friend at Ares and at William's Sonoma. Q. Where can I get Bartenders^Barkeepers Friend? I live in Florida. Q. A house cleaner is believed to have used Weiman silver polish on a stainless steel salad serving set that we had received as a wedding gift. The result of the "cleaning" is that what was once a lustrous shine is now almost entirely dull, with large patches of greenish-darkened metal, and a few places where there is now copper-colored metal. I do not understand metallurgy sufficiently to know if one metal was plated over another, and now the underlying metal is now exposed, or if the discoloring is the result of some type of oxide on the metal. Some suggested cleaning materials (including vinegar, stainless steel cleaner, Bar Keepers Friend) have been used, but with no effect. I would like to know, first, what happened; and second, is there any practicable restorative course of action available (e.g., cleaning product, plating)? A. Hi Lawrence, sorry for your troubles. But "patches of greenish-darkened" and "copper-colored" and "one metal plated over another?" don't sound at all like typical observations of stainless steel behavior. Why do you believe the set is stainless steel -- does it say so? A. Hi again Lawrence. Stainless steel is rarely plated, especially for serving sets. Rather, it's the same material through and through (an alloy of steel, chromium, sometimes nickel, plus very small amounts of other stuff). What you are describing sounds like the set is made of brass and was nickel and chromium plated. I'm surprised that silver polish would destroy the plating that way -- but I guess it did, exposing at least patches of brass. It can be replated, but perhaps not affordably. Replacement would probably be cheaper. A. For anyone who has stained their sink with the silver cleaner tarn-x, a product called Barkeepers Friend [linked by editor to product info at Amazon] will remove the stain! My sink was 2 weeks old and I tried lemon juice and baking soda and white vinegar. Those worked a little with two hours of scrubbing. I ordered bar keepers friend on Amazon and used it on the stain. It took the whole stain out. If you are searching the web for any cleaner that really works on a stainless steel sink, this is it. Remember to always rub in the direction of the grain. I used a soft cloth to run the cleaner in. I used the powder formula. Hope this helps. There's hope! Not sure if I have the same thing, but from your photo it looks very similar. I also am not sure how mine came about, but what worked for me was toothpaste! I left a reasonably thick layer on for 5-10 minutes then used a 'stainless steel scourer, and scrubbed scrubbed it all off! Thank you so much! My nephew was using Tarn-X and spilled it down the front of my stainless steel dishwasher front creating long black drip marks. It about killed me to see it. I did not want to mention it to him because he was living with me after losing his home to the fire storm this past Fall in California. I used my liquid Barkeepers Friend and scrubbed like crazy and it came off! BKF saved the day! Q. Can anyone give me the directions for using Tarn-x? The bottle I have has most of the directions rubbed off & I just have a few really bad places on a silver trophy I've been cleaning with Wright's Silver Cream which has been working wonderfully. It's too big to dip it into a bowl but I can't even read how to apply it. Q. Hi hoping you can help. 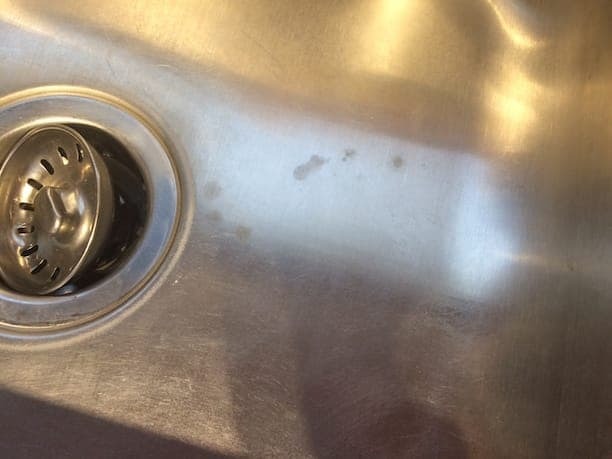 My husband was soaking an object in CLR and some splashed and he didn't realize it so the CLR probably sat on the surface of our brushed stainless steel sink for 15-20 hrs. I see lots of solutions for smooth sinks but nothing for brushed steel. A. Hi Joanne. If a mild polish is unable to remove the discoloration, you may need an abrasive kit like Scratch-B-Gone [a finishing.com supporting advertiser] (see topic 24168 for example), but blending scratches is harder work to do right than trying Barkeeper's Friend, rubbing in the direction of the grain, as Danna H. suggests above. Good luck. Q. I have the same problem with my stainless steel sink too and I was just looking at Bar Keepers Friend on Amazon UK but there are several varieties to choose from. But people are talking about the powdered cleanser polisher, and the container even says "Stainless Steel" up near the top (at least here in America).